Often, I get asked about applications for secondary education. One company that makes many great reading comprehension applications that my middle school and high school students can use is eSkills Learning. Minimod applications such as Fact or Opinion and Reading for Inferences contain paragraphs and multiple choice questions to go with them. 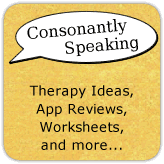 Continue reading for more information on the applications and how to use them in speech therapy, plus a giveaway of two different MiniMod applications! There are two buttons shown on the main page - Instructions and Play Now. This page will discuss different ways to use the applications either in single player game mode, multiplayer game mode, or practice mode. Game mode is in Bingo game format. It will also show the levels of play based on reading levels. There is also an information button to learn more about the applications. Choose between single player, multiplayer, and practice mode. You can also view the credits of the application. If you choose single or multiplayer game play, you must then choose the difficulty (Red, Blue, or Green; based on reading levels). Then, the application will show a Bingo game board. 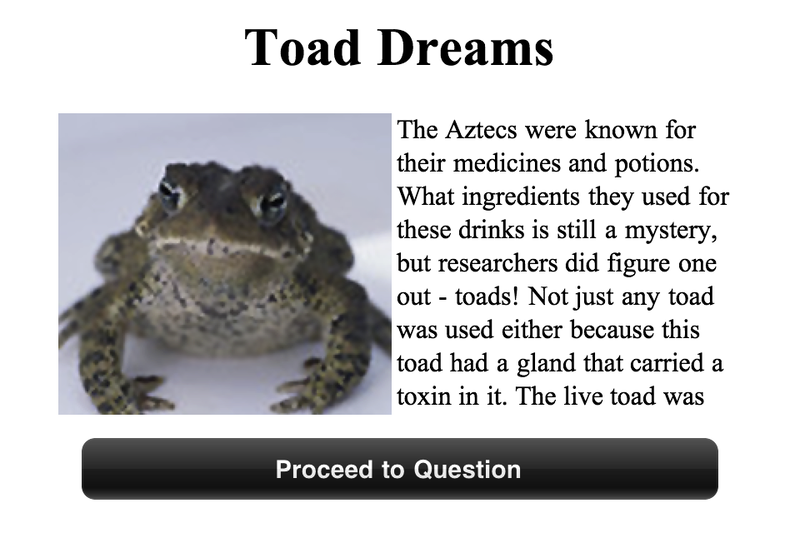 Press the "Question" button to view a paragraph and answer the question that follows. If the answer is incorrect, the application will tell you to try again. If the user answers correctly, it will go back to the Bingo board. Then, it will show the letter and number combination to place a chip on the Bingo board. It is randomized as to whether or not the letter and number will be on the Bingo board. Once a sequence of five dots in a row is created, the game will be won. If multiplayer is chosen, the other player must have the application and bluetooth must be enabled to play on more than one device against each other. If practice mode is chosen, choose the number of questions, then a paragraph will appear with multiple choice questions to answer. If an answer is chosen correctly, the next question will show. If not, it will notify the user to re-read the passage or see the answer to the question. 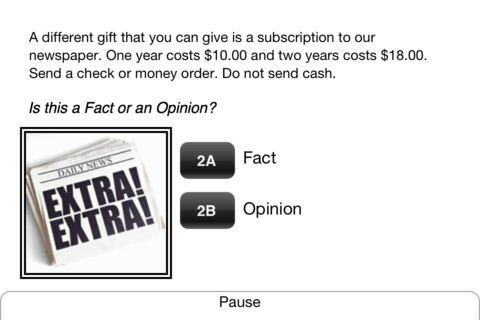 In the Fact or Opinion application, paragraphs are shown to answer the paragraph is a fact or an opinion or there will be multiple sentences to choose from as to which is the fact or which is the opinion. 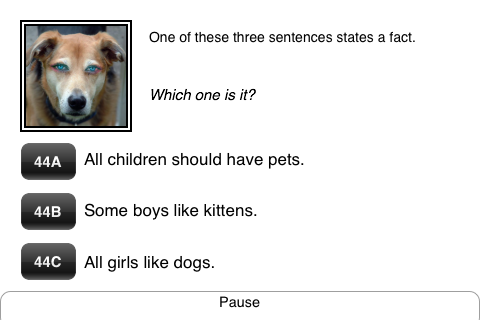 In the Reading for Inferences, there is an inferential multiple choice question to answer based on the paragraph. These applications are great for secondary education and reading comprehension. Reading levels are included on each application. The applications not only include paragraphs to read and questions to answer, but also a game element to motivate students. It would be great to have a multi-player element that does not involve using two different devices. Articulation/Voice/Fluency - Have students read the paragraphs and questions using their correct speech sounds, fluency strategies, and vocal strategies. Reading Comprehension - After reading a paragraph based on a students' reading level, have the student answer the question following each paragraph. Auditory Comprehension - Read the paragraph aloud to the student. After reading the paragraph, have the student answer the question following the paragraph. Receptive Language - Each question has to do with a specific topic. After reading about the topic, the student is required to answer a question about the topic. Inferences - The Reading for Inferences application requires students to make an inference based on a paragraph. Fact or Opinion - In the Fact or Opinion application, students are required to read a paragraph or sentence and determine if it is a fact or an opinion. Prior to using the application, discuss the difference between facts and opinions. Expressive Language - Have students discuss a topic after reading about it. They can even write a sentence or paragraph about the topic. 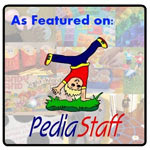 MiniMod Fact or Opinion and Reading for Inferences are both $8.99 for the iPod Touch, iPhone, and iPad. You can purchase the Lite versions of the MiniMod applications for $3.99 each. 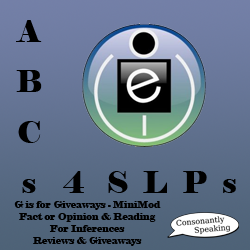 Consonantly Speaking was given a code for each of the Minimod Fact or Opinion and Reading for Inferences to give away with this review. Enter the giveaways below for your chance to win either the MiniMod Fact or Opinion or MiniMod Reading for Inferences applications!